Great Lake charter boat captains choose Penn's GT2 Levelwind Reels with Line Counter for their unmatched durability and reliable power. 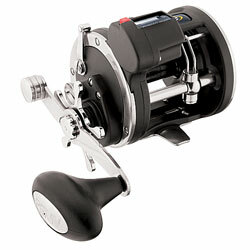 Perhaps the most versatile series of reels, the GT2 Levelwind Reels with Line Counter have seen and done it. Constructed with a lightweight one-piece graphite frame, black anodized aluminum spool, stainless steel pinion, manganese-bronze main gear, 4 aircraft-grade sealed stainless ball bearings, and an easy-to-operate HT-100™ powered drag system.